The Mother House of the Holy Names Sisters in Quebec, Canada, was only a four-hour car ride from Glens Falls, New York, the home of the Chism family. However it was Jocie-Rhea Chism’s father’s transfer to Everett, Washington, six hours by plane, which began her relationship with the Holy Names Sisters. The Holy Names taught at Immaculate Conception Grade School where she and her brother enrolled. Her connection with the Sisters continued through high school as she volunteered in the school’s weekend and summer school religion classes. Those experiences moved Jocie-Rhea to accept the possibility of a religious vocation and a teaching career. 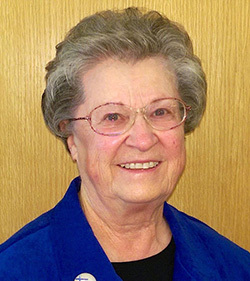 After her entry in the Holy Names Community, Sister Jocie-Rhea spent 34 years as a teacher and administrator in Catholic elementary schools. Her first classroom assignment was first grade at St. Patrick’s School, Spokane, Washington. After several years in eastern Washington, she moved to Seattle to begin an administrative degree while teaching at St. Joseph School. With the resignation of the school principal, the pastor named Jocie-Rhea and Mr. George Hofbauer as co-principals. Their collaboration continued until she was selected as one of her Community’s Washington province administrators. Completing her six-year term in province leadership, Jocie-Rhea returned to St. Joseph School as a third-grade teacher and, later, a librarian. Retiring from elementary education in 2015, she wanted to be involved in other Province ministries and felt that the retreat work of Villa Maria del Mar in Santa Cruz, California, would be a good fit and a new experience.